"I thought solving maths problems was like putting your head in snow, but this is so exciting it's like opening a present at Christmas!" During key Stage 1, pupils develop their knowledge and understanding of mathematics through practical activity, exploration and discussion. They learn to count, read, write and order numbers to 100 and beyond and develop a range of mental calculation skills and use these confidently in different settings. They learn about shape and space through practical activity which builds on their understanding of their immediate environment. They begin to grasp mathematical language, using it to talk about their methods and explain their reasoning when solving problems. During key Stage 2, pupils use the number system more confidently. They move from counting reliably to calculating fluently with all four number operations, trying to tackle a problem with mental methods before using any other approach. Pupils explore features of shape and space and develop their measuring skills in a range of contexts. They discuss and present their methods and reasoning using a wider range of mathematical language, diagrams and charts. - can solve problems by applying their mathematics to a variety of routine and non-routine problems with increasing sophistication, including breaking down problems into a series of simpler steps and persevering in seeking solutions. In order to develop the pupils' fluency, reasoning and problems solving skills, we also have specific dedicated lessons (FRPS) that promote and encourage the children to fully engage in investigations and explore, and expand upon, their understanding. As much as possible we learn our maths outside and apply to other areas of the curriculum. Recently this has involved trees, worms and digging! We also have weeks dedicated to learning maths in different ways, for example maths through stories and what we call 'Inspirational Maths'. "Writing is a tool to pour your imagination on to paper." 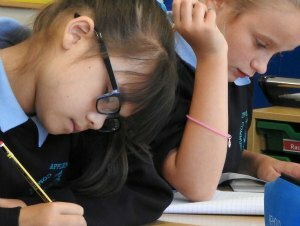 Pupils are encouraged to develop a joy in communicating through writing; from the emergent writing in the Early Years Foundation Stage to the accomplished and confident writers who leave our school in Year 6. Development in writing follows from the enjoyment and inspiration provided by high quality texts; alongside the systematic teaching of handwriting, spelling and grammar. Pupils are given a purpose for writing, with opportunities to write in many different genres. 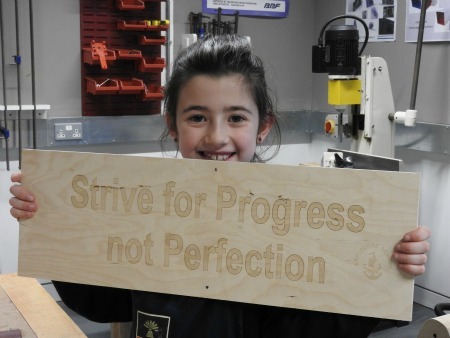 Pupils are proud of their high quality outcomes, which involve some very creative bookmaking skills! Visiting authors, such as the poet, James Carter, inspire pupils' writing. During Key Stage 1, pupils compose sentences orally and write them down, using their phonic knowledge to spell words they have not yet learned. They form letters correctly and establish good handwriting habits. They begin to use spelling rules and patterns and start to use punctuation accurately. 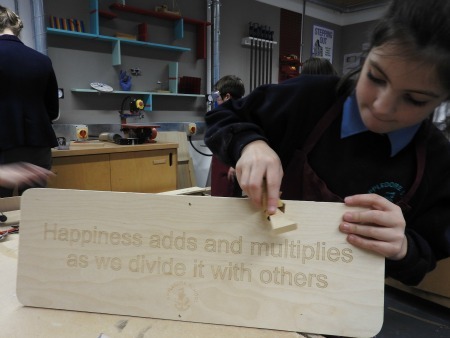 Pupils are given many opportunities to write across all areas of the curriculum, for a variety of different purposes. During Key Stage 2, pupils build on this foundation to compose sentences using more complex grammatical structures. They use a range of punctuation accurately. Spelling becomes more accurate and pupils are able to use their knowledge of spelling conventions to spell words they have not yet been taught. Pupils are given opportunities to write in many different genres, across all areas of the curriculum. For ideas to help your child learn their spellings, please click here. "For me, reading is escapism into my own mind, something to be passionate about." Through a broad range of high quality texts, pupils develop fluency, comprehension and a love of reading. Pupils read with children from other classes, with our older pupils being mentors and role models for the youngest. Our well-stocked school library gives pupils the opportunity to select books to read for enjoyment. During Key Stage 1, pupils build on work from the Early Years Foundation Stage and are taught to sound and blend unfamiliar printed words quickly and accurately using phonic knowledge and skills. Pupils develop fluency in order to read words easily and automatically. They develop pleasure in reading and increase their understanding of the books they read and listen to. During Key Stage 2, pupils build on their fluency and develop vocabulary and the depth and breadth of their reading. Pupils continue to develop their understanding of more complex texts. They become independent, fluent and enthusiastic readers who read widely and frequently. The overarching aim of the national curriculum for English is to promote high standards of literacy by equipping pupils with a strong command of the spoken and written word, and to develop their love of literature through widespread reading for enjoyment. Throughout the school, science promotes curiosity about the world around us and develops a sense of excitement and enthusiasm about making new discoveries. The children are provided with opportunities to explore, investigate and question the world around them through first hand ‘hands on’ learning experiences (investigations, workshops and visits), research tasks and learning from others. This includes links with local secondary schools who are able to provide resources, expertise and workshops to broaden the children’s experiences. They develop skills for working scientifically as well as building knowledge of scientific concepts within the three main disciplines of physics, chemistry and biology. At Key Stage 1, scientific learning focuses primarily on asking simple questions and recognising that they can be answered in different ways. They develop these skills through the exploration of humans including other animals, plants, uses of everyday materials, living things and their habitats, the changing seasons as well as light and forces. gathering and recording data to help in answering questions. Within this phase, the children are primarily ‘hands on’, talking about their discoveries and developing scientific vocabulary through conversation. They use simple equipment and measuring devices and present their findings to others in a variety of ways, e.g. pictorially, in simple charts, through verbal presentation or demonstration. At Key Stage 2, the children’s ability to work scientifically gradually develops, leading to children being able to select the most appropriate ways to answer science questions then plan and carry out comparative and fair tests with increasing independence. They also develop the ability to draw conclusions based on their data and observations, using evidence to justify their ideas. The children develop these skills through the study of physics (forces and magnets, light, sound, electricity, forces and magnets, earth and space), chemistry (rocks, states of matter, properties and changes of materials) and biology (plants, animals including humans, living things and their habitats, evolution and inheritance).